Rangers' 1-0 win over Celtic in December was their "best performance" this season, says Daniel Candeias as he targets a repeat result. The winger believes the international break has helped his side's chances at Celtic Park on 31 March. Rangers have failed to win in four games and trail Scottish Premiership leaders Celtic by 10 points. "This time to recover will help us to be fresh for next week," Candeias told the Rangers website. Ryan Jack's goal at Ibrox gave Rangers their first Old Firm win in 13 attempts and moved them level on points with Celtic who had a game in hand. 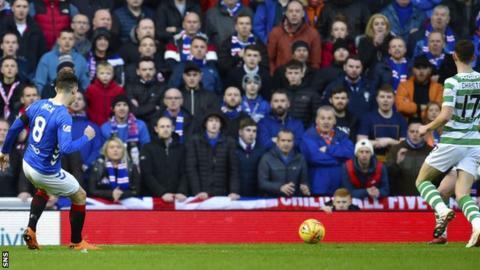 However, the Ibrox club have since fallen off pace by winning just five of their nine league matches in 2019. "The last game against them was our best performance." Candeias said. "It has been a long season and it is good to rest the body. This break is important to recover the players who have injuries as they are important for the team." The Portuguese, 31, has bittersweet memories of his sole Old Firm goal as it came in a 3-2 home defeat last March. "It was a happy moment to score in the best game in Scotland," added Candeias. "But I hope my next goal against Celtic will help the team to win the game."